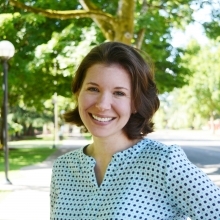 Dana Bleakney-Huebsch is a Project Coordinator/Supervisor for the Center on Early Learning & Youth Development. In this position, she oversees daily operations of Spark, Oregon's Quality Rating and Improvement System and works directly with partners at the Early Learning Division. Before joining The Research Institute, Dana developed a rich understanding of the early childhood care and education field from a variety of experiences. She earned her Master’s degree in Child Development from California State University, San Bernardino, in 2012. While there, she taught in the university’s Infant and Toddler Lab School, completed research on word recognition, and taught undergraduate courses.